Last month, our Platte River Prairies crew visited a South Dakota farm owned by our friends Gerry Steinauer and Grace Kostel. Gerry showed us around the farm, including some prairies he and Grace have been trying to rehabilitate. It was late afternoon, and scattered fluffy clouds and golden prairie grasses made for a beautiful backdrop for our hike. 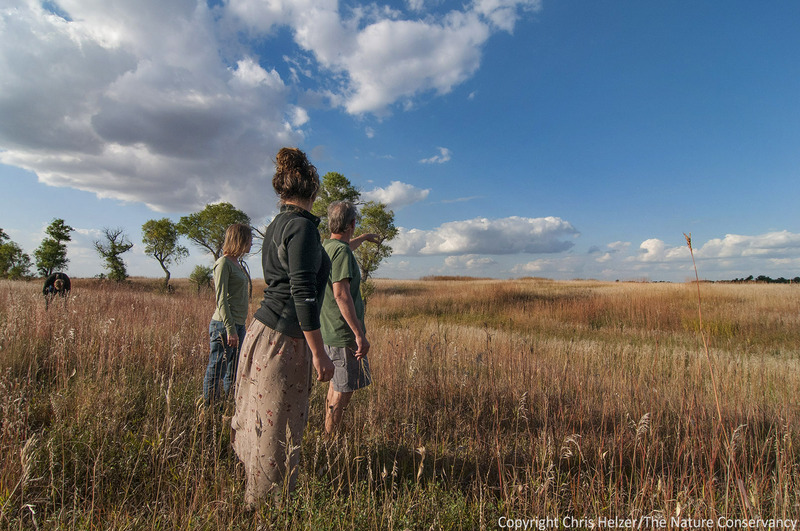 Gerry Steinauer gives Anne and Eliza a tour of his South Dakota prairie near Wagner, SD. Even though wildflower blooming season is over for the year, there is still plenty to see in autumn prairies. Fluffy white seeds of goldenrods and asters fly into the sky as we walk by. Migrating sparrows pop out of the grass but quickly drop back down, giving us just enough time to make wild guesses about species identification. Harriers course back and forth above the tall grasses, making flight look effortless and wonderful. In every patch of short sparse vegetation, grasshoppers gather to soak up as much sun as they can before their season ends with the first hard freeze. That freeze is yet to come, but the chill in the morning air leaves no doubt that it’s just around the corner. Last week, I helped arrange a tour of recently-burned oak woodlands at Indian Cave State Park, an eastern Nebraska site owned and managed by Nebraska Game and Parks Commission. Indian Cave State Park is one of very few deciduous woodlands in Nebraska that is managed with prescribed fire. The Nature Conservancy’s Rulo Bluffs Preserve is another, but while we started using fire back in the mid 1990’s, we’ve not been able to use it as consistently as we’d like. Seeing the results of four years of annual burning at Indian Cave State Park was a good incentive to keep trying to find ways to increase our burn frequency down at Rulo. You can read here about a fire we conducted at Rulo last year. Kent Pfeiffer (center) stands in a portion of woodland that has been burned four years in a row and points out some of the changes that have occurred over that time. 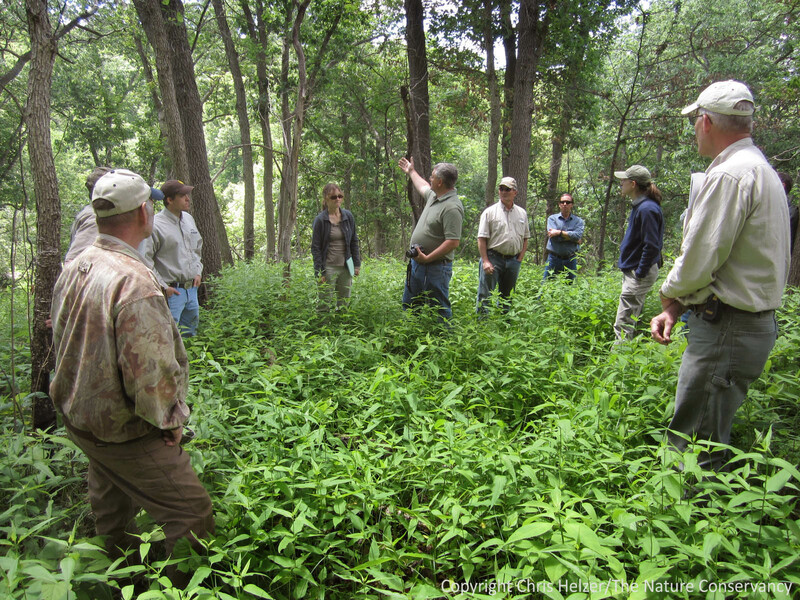 The tour was led by Gerry Steinauer (state botanist for Nebraska Game and Parks) and Kent Pfeiffer (Northern Prairies Land Trust), who have been leading the charge for woodland burning in eastern Nebraska. In addition to Kent and Gerry, and several other Game and Parks biologists, the tour group included staff from the Nebraska Forest Service and the Bureau of Indian Affairs.